As in every year on this date, I’m finding it hard to concentrate on anything. Nothing else current seems to be as pressing or urgent as something that happened 12 years ago. No matter where you are in this country now, or where you were back then, you’re probably touched by those events just as I was. 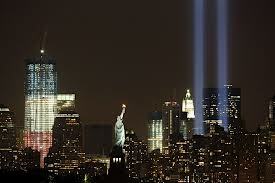 This day, September 11th, is a day to pause and remember what happened. Most likely you’ll immediately answer the “Where were you when you heard?” question. It might be something mundane like in a store, or just waking up. Or you might have been right there watching it in front of your very eyes. But no matter how it played out for you I constantly hear the same reaction from everyone I speak to. They tell me how instantly they connected with the people around them. It didn’t matter how different we were from each other on that fateful morning. What mattered was that we were there for each other when our country was under attack. When it slowly became clear that this was no accident, that there were going to have to be serious consequences from this day, we each looked at those around us – strangers, family, friends – and took some comfort. We’re not finished with this struggle. We’re not free from danger. That’s why today is so much more than memorial. It’s a re-dedication to the ideals and principles that brought us to this moment. To recommitting ourselves to standing up for freedom and justice in a dangerous world. We each face tough decisions every day of our lives. And sometimes it’s hard reliving moments from our past. But nothing makes us stronger – not as people nor as a nation – than looking tragedy in the eye and accepting it. Days like this are far too precious to waste on pettiness. We need to seize these moments, remember our fallen loved ones, and move as one into a brighter future. I hope you all join me in praying that America sees an end to tragedy and fear. And that we move into a glorious sunrise of hope and equality for all mankind.